This month's Staff Picks include fine art, silver, and beautiful jewelry for men and women. Read on to learn more about our staff's favorite items for this month! The above opal pendant is staff member Vida's choice for this month. "This pendant has an arresting myriad of colors, it is so regal and stunning! 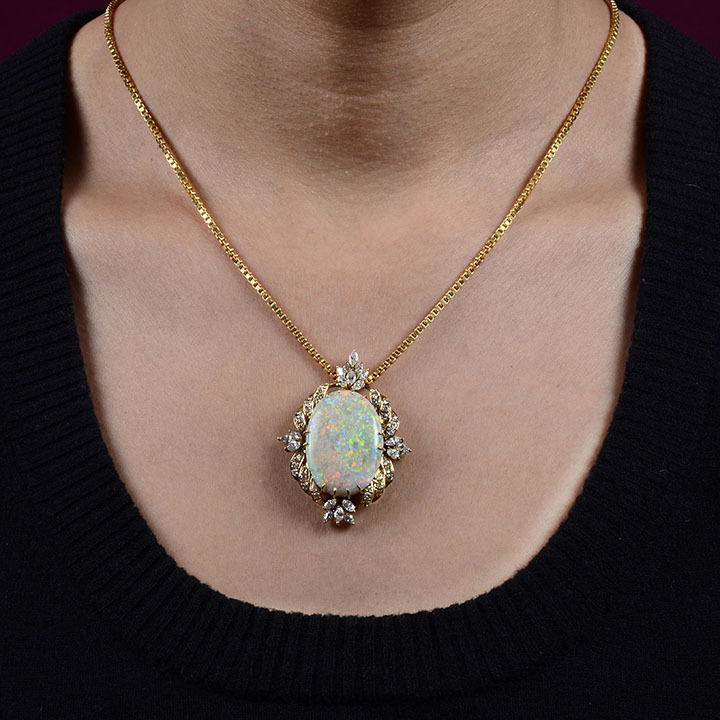 With an opal surrounded by 19 marquise diamonds, this unique and luxurious necklace displays a charm that is unparalleled." 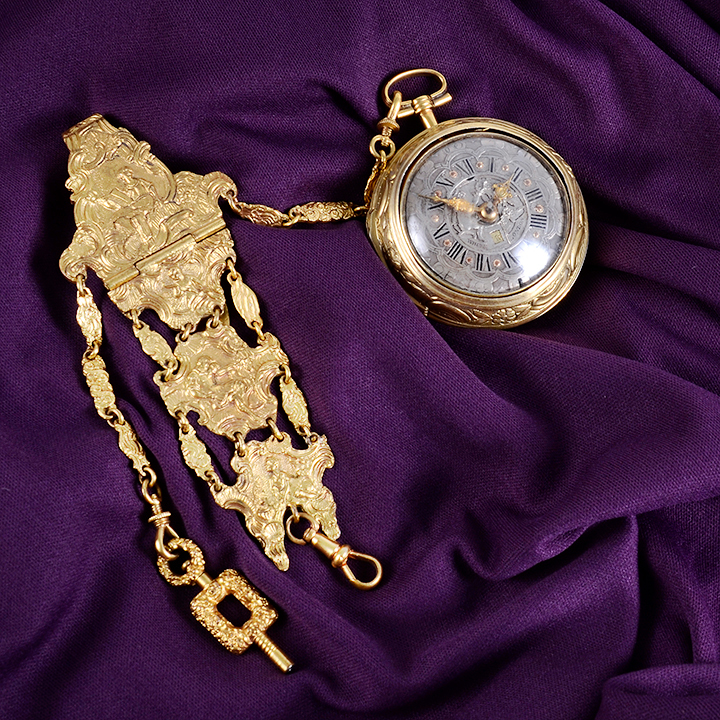 This month, Misty has chosen a beautiful pocket watch. "This is an amazing and beautiful piece of history that is still running well today – an astounding 251 years after it was made! The detailing of the champlevé dial and inside on the verge fusee movement is astonishing," she says. "This pair case watch even boasts a calendar feature - remember this was designed and created in 1767! Just wow! To top it all off, it comes on a chatelaine with the original key. This fascinating pair case pocket watch by Jonathan White is a true delight that I could spend hours reveling." 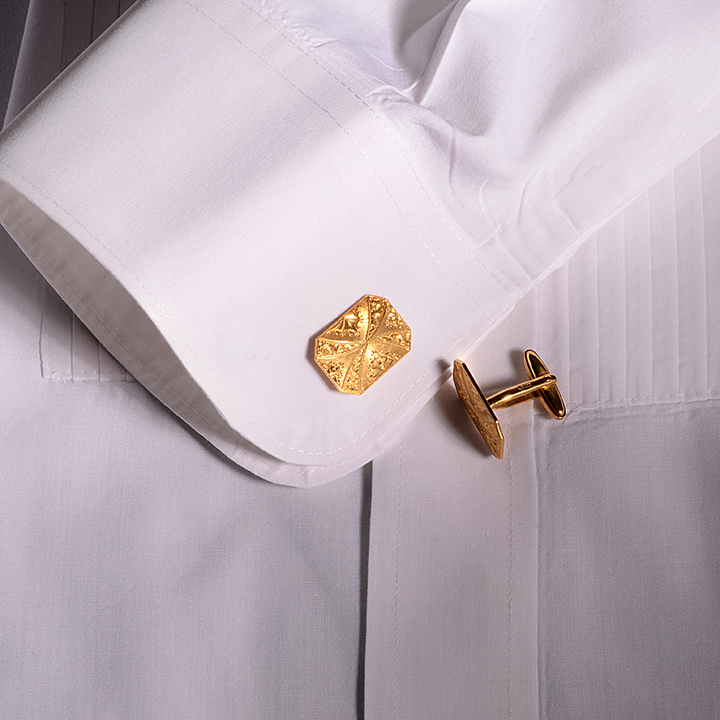 Michael's Staff Pick for July is a pair of vintage cuff links. "These are beautifully designed and engraved in 18K yellow gold. Although not as in vogue today as they were in the early to mid 20th century, we still have gentlemen of all age groups come in looking for these stylish accessories and we currently have over 25 pair available. ZZ Top may have said it best, 'every girl crazy for a sharp dressed man.'" Kathy's July Staff Pick is a silver epergne. 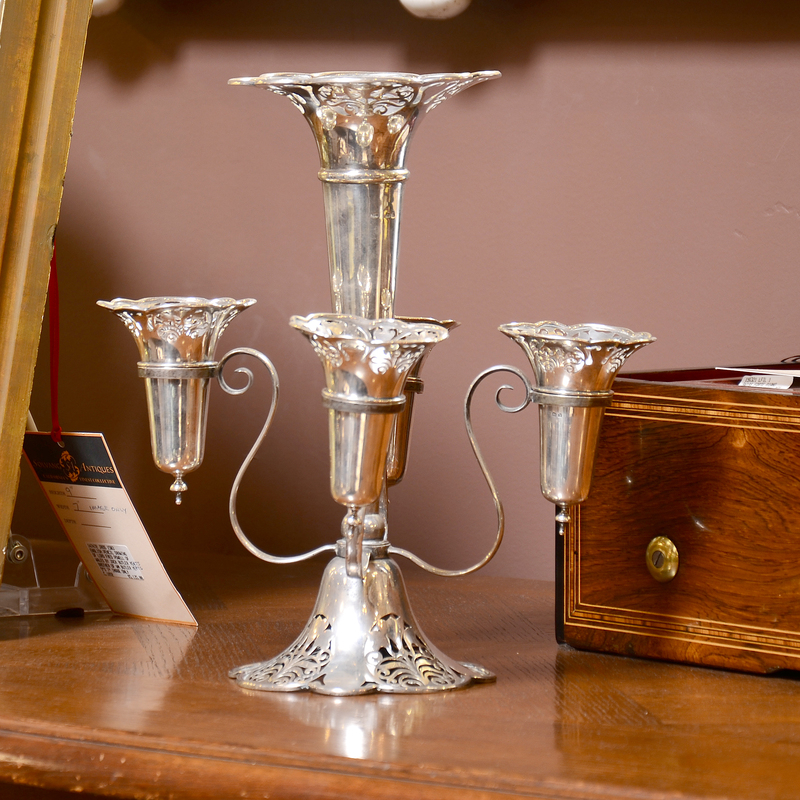 "This is a striking sterling silver Edwardian epergne. This beauty features five rotating vases with an almost "lace" like decorative edge. It was made in England by Fattorini & Sons in 1910. This company was founded by an Italian family and they still have a shop in Birmingham, England where the 6th generation still manages the shop." 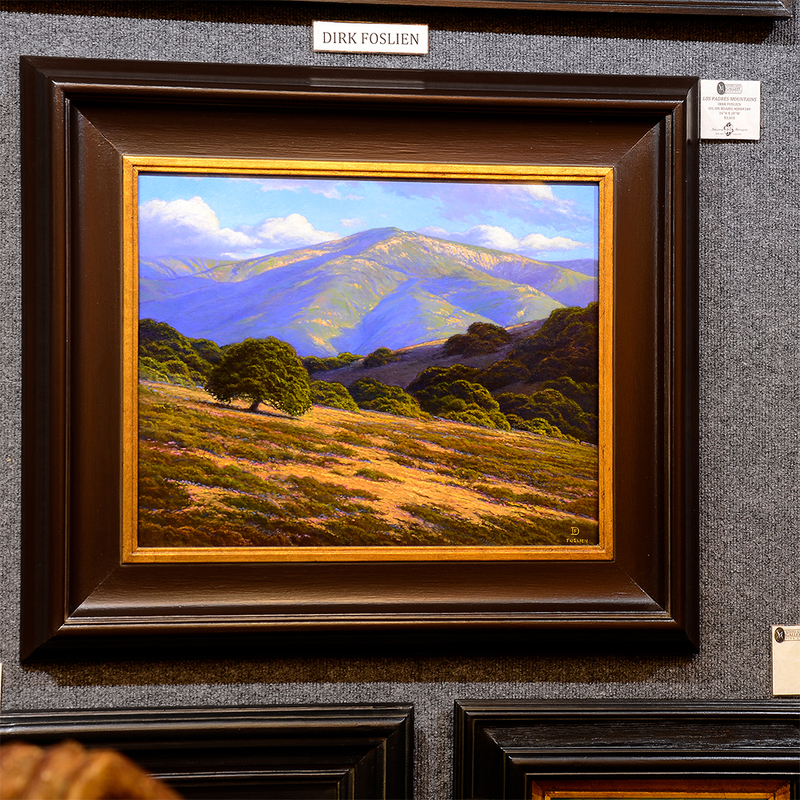 Judith Hale's choice for July is a painting by Dirk Foslien entitled Los Padres Mountains. "Dirk just has a way of depicting the landscape that is truly beautiful," Judith says. "He is able to capture the light and shadows of the sunlight as it passes over. This view of the Los Padres Mountains in the summer shows the golden grasses and the remaining greenery of the hillsides. It is the beautiful drive over the San Marcos Pass into the Santa Ynez Valley." A native Californian, Dirk became interested in art through his father's influence. After studying graphic arts and three-dimensional design in college, he worked a brief time as an aerospace production artist and graphic illustrator. He studied at Muse Academy in Baltimore, MD where he learned classical old-world painting techniques. Dirk has been part of the Judith Hale Gallery since 1996. 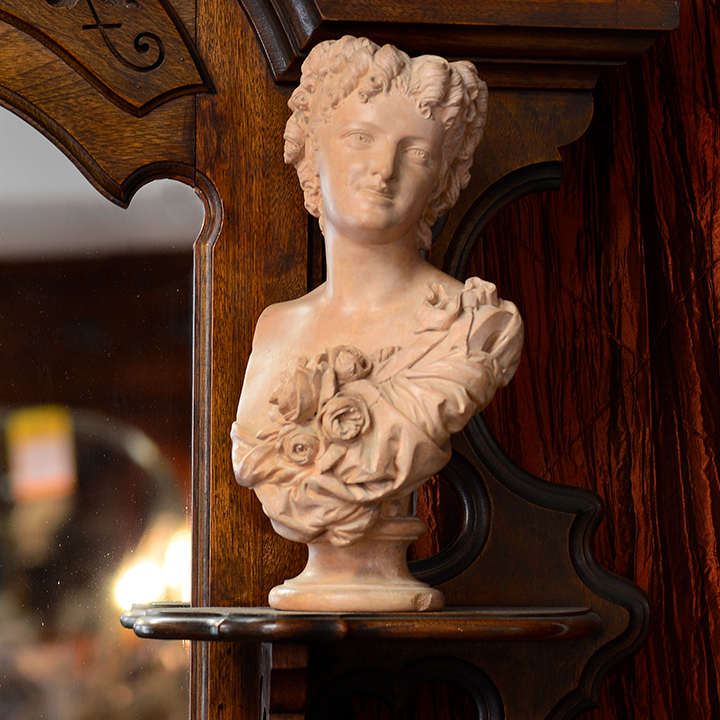 Lori's choice for this month is a terra cotta bust. Lori says: "I love how it can be put anywhere and adds a beautiful artistic touch to any space!"